The new 2014 Subaru Forester XT is on its third continent as it continues the five continent Forester Live trek around the globe. We’ve seen the Forester take on Australia and Eurasia, and now Forester takes on the challenging and beautiful Chapman’s Peak in South Africa in the third stage of Forester Live. In the southern most country in Africa, South Africa on the Cape of Good Hope, there is a place where the Atlantic and Indian Ocean clash. 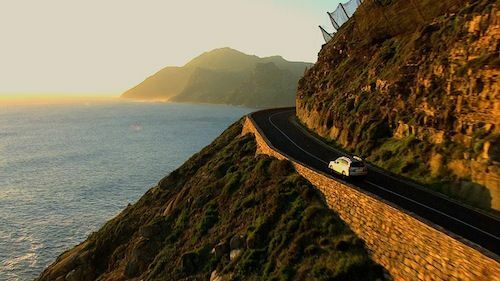 The location for this next stage is Chapman’s Peak that is known for its magnificent views and challenging road that hangs on the side of the mountain. Are you thinking of taking a long family driving vacation this summer? Akihiko Ouchi, caravan crew chief and motor journalist, and driver Andrew Lynott will see how the new Forster XT performs on the mountain road above the ocean. The Forester is the perfect SUV to drive the stretch of windy and twisty road as it was designed for these type of conditions. The new-generation Forester was completely redesigned for 2014 and has “sports car-level motion” and engine performance, offers ease of handling, comfort, and large storage capability. The Forester is a global car and will be driven in many extreme conditions around the world. How will it perform in South Africa? The crew heads to Chapman’s Peak to test the mid-size SUV’s features again. The crew has taken the Forester across the continent of Australia and won, and also the frozen tundra in Eurasia. This is the seventh demonstration and it takes place on the winding road by the beautiful coastline that weaves along the sheer cliffs. The date is May 13, the weather is 22 degrees C, and its day 182 of Forester Live.The road has plenty of challenges and is full of blind corners and undulations along the way. The famous tourist spot is known for its lush green ocean views and rugged mountains that surround it. The roads in this area of South Africa are very interesting because of the tight corners and twists that seem to challenge the driver, Andrew Lynott who is a crew member of the Forester Live African caravan. Many parts of the road are bumpy and uneven because of the traffic. It’s hard on the vehicle, especially the suspension and challenging because it’s hard to keep the car stable and connected to the road with all four wheels. But this is exactly what Subaru engineers had in mind when they developed the new Forester. The new crossover is ideal for families as they travel this summer. There is a synergy between the wheels and suspension as they seem to cooperate to bring the best out of each other. Andrew says, the handling feels very good through the corners. This is dream road for any sports enthusiast driver, and the Forester stays firmly planted as the road hugs the mountain as the ocean is just below the steep drop-off. The driver quickens the pace and shifts into Sport Mode. The Forester adopts a rigid car body and a chassis with high impact absorption. So it can drive with remarkable balance and rhythm even in the continuous blind corners. But you don't have to be a professional driver to enjoy Foresters benefits. The Subaru Boxer engine sits low in the chassis and provides the perfect balance for a mid-size crossover. The torque of the engine respond to the drivers input and picks up speed going uphill. Ouchi says, the engine is a “peaky sports engine and is very exciting to drive.” It generates 350 Nm torque and the combination of the new-generation Boxer engine features Direct Injection Turbo power (DIT). It comes mated to a high-torque Lineartronic automatic transmission that lets the engine gain and drop speed smoothly. It’s commonly believed that only two-wheel-drive cars can weave through twisty turns this smoothly. But the all-wheel-drive Forester has well-controlled torque split and rotation balance control, and the driving force is maintained by computer. So it feels natural and comfortable. It features wide-range engine power that is full of torque and is responsive and enjoyable to drive and is stress-free for the driver. The Forester is a good choice for families taking on a long vacation trip this summer. Watch Forest Live as it takes on Chapman’s Peak video.